Sir Liam said that the deaths of 27 people in England were confirmed to have been linked to swine flu, compared with 26 last week. 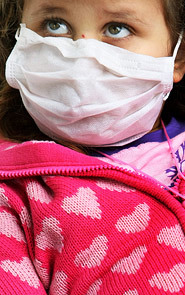 As of Wednesday morning 793 people were in hospital in England with the virus, and 81 were in intensive care. Yesterday Natasha Newman, 16, of Highgate, North London, was seriously ill in hospital in Athens after contracting swine flu while on holiday on the island of Cephalonia. Her parents, Julian Newman and Nikki Boughton, were at her bedside at the Agia Sofia children’s hospital, said a spokeswoman for Mr Newman’s business, J. Newman Textiles. “This is a very distressing and worrying time,” she said. Peter Holden, the British Medical Association’s lead expert on swine flu, suggested that Tamiflu was being overused and did not need to be offered to everyone with mild symptoms. “The National Pandemic Flu Service has been a great success, and was needed to take the pressure off GPs,” he said. “But the threshold for getting Tamiflu should be quite high. A total of 103 children took part in the London study, of which 85 were given the drug as a precaution after a classmate received a diagnosis of swine flu. Of those, 45 experienced one or more side-effects. The most common was nausea (29 per cent), followed by stomach pain or cramps (20 per cent) and problems sleeping (12 per cent). Almost one in five had a “neuropsychiatric side-effect”, such as inability to think clearly, nightmares and “behaving strangely”, according to the research, published in Eurosurveillance, a journal of disease. The study was carried out in April and May when the drug was being issued as a preventive measure. The findings were echoed by a study of children at a school in the South West where a pupil had caught the disease in Mexico. Health officials in Japan have recommended against prescribing Tamiflu to teenagers over fears it causes a rise in “neuropsychiatric events”. The researchers said that clinical trials had shown that about 20 per cent of adults reported side-effects of either nausea or vomiting after taking Tamiflu. Both the Department of Health and the Medicines and Healthcare Regulatory products Agency said that the drug was safe, and that the benefits of treating early symptoms and avoiding potentially serious complications could outweigh the risks of side-effects. Paul Craig Roberts: Statistical Deceptions; How Fake is the “Recovery”?